Most Americans say Donald Trump's proposal to let his children control the family business while he's president doesn't go far enough to prevent conflicts of interest, according to a new CNN/ORC poll. The poll found that 59% of people say Trump's plan isn't enough, compared with 39% who say it is. Ethics experts say no previous president has been so exposed to conflicts and allegations of political corruption because of business interests. They say that remains true even if he hands control to the children. Trump said on Twitter on Monday his business dealings were well-known before the election, and "only the crooked media makes this a big deal!" 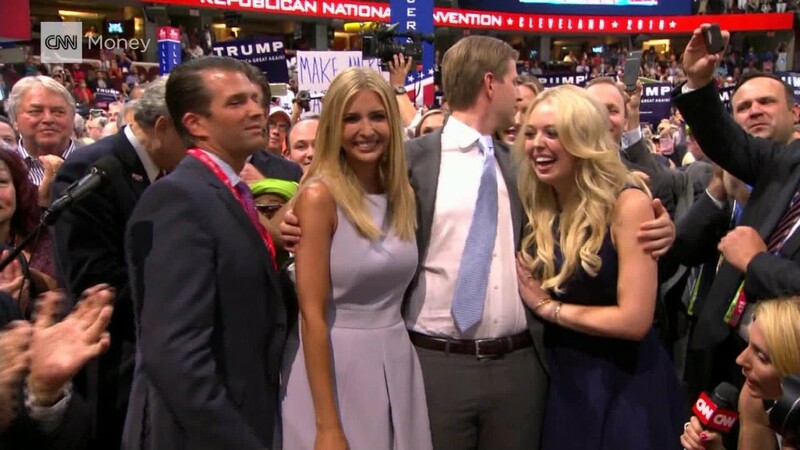 All three of Trump's oldest children — Ivanka, Donald Jr. and Eric — are members of his political transition team, as is his son-in-law, Jared Kushner. Ivanka Trump and Kushner were in the room for a meeting between Donald Trump and Japanese prime minister Shinzo Abe last week. Trump, as president-elect, met last week with three Indian business partners building a property near Mumbai, The New York Times reported. And diplomats have been staying at the Trump International Hotel in Washington, spending money in hopes that Trump will notice, The Washington Post reported. Trump's transition team has said he will follow the law. The president is exempt from most federal law on conflicts of interest. In the CNN poll, concerns about conflicts of interest break along partisan lines. While 71% of Republicans say Trump's plan goes far enough to prevent conflicts, only 41% of independents and 8% of Democrats agree. Those who approve of how Trump is handling the transition or think he is going to be a good president are also more likely to say the proposal goes far enough than those who disapprove or think he'll do a bad job as president. The poll of 1,003 adults was conducted by telephone between Nov. 17 and 20. The margin of sampling error is 3 percentage points. Trump's supporters, including top adviser Rudy Giuliani, have defended the decision to put the children in charge of the business. "It's unrealistic to say you're going to take away the business from the three people who are running it," Giuliani told CNN's Jake Tapper on "State of the Union" this month, referring to daughter Ivanka and sons Eric and Donald Jr. "You'd be putting them out of work." --CNN Polling Director Jennifer Agiesta and CNNMoney's Cristina Alesci contributed to this story.